We offer two options for built-in credit card processing. Select Mercury Payment Systems as your processor and get free gift card processing! Credit card sales are easier when your POS system has built-in credit card support. 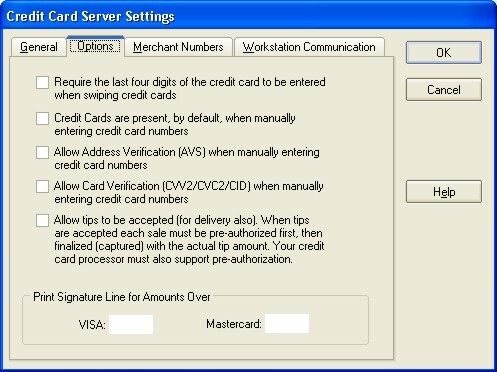 When you process credit cards with our solution, every computer on your network can be a credit card terminal. Enjoy the benefits and cost savings of having a Point of Sale System for your Business! For additional information about Mercury Payment Systems, contact your Point of Success dealer or Point of Success staff at (800) 752-3565. Using PCCharge Payment Server, merchants can, in most cases, stay with their current credit card processor. See the PCCharge web site for details on this software. Important: Before purchasing PCCharge Payment Server and the Point of Success PCCharge Connector, contact your credit card processor to confirm that they support restaurant credit card processing with tips for your merchant account. Some processors will place credit card terminals in restaurant businesses that connect with processing locations that do not process tips normally. You should also check the PCCharge certified credit card processors list for this same information. If your processor does not support restaurant businesses with tips or if your merchant account is not set up for tips, you will not be paid for tips on credit card orders when using PCCharge Payment Server. IMPORTANT: Gift card processing in Point of Success is not available when using PCCharge Payment Server. In consideration of these elements, Point of Success software is compliant with the Payment Card Industry Data Security Standard version 1.1. Protection of credit card information involves much more than just the point of sale software you use. Other elements include setting up and maintaining a secure network, internal business security practices, and using a PCI compliant credit card processor. It is a merchant's responsibility to ensure that all the data security standards are met. � Copyright 2008-09, Affordable Point of Sale Solution is a Division of NHVT Computer Services, LLC. All Rights Reserved. Designed and Hosted by GlobeInt.com, Inc.